Longchamp is one of those must have brands and I am sure that most of my readers have at least a Le Pliage among the other handbags in their wardrobe. In fact Le Pliage has been a bestseller for the company all over the world and the fact that it has been produced in all the colours of the spectrum it means that it is a much loved bag. I've got one in orange and it is a perfect accessory to put in a suitcase when away and you've got no room for a handbag especially with some airlines' rules. The new collection that is going to hit the stores in the next few weeks has got a great selection of colours, patterns and other handbag models to help you discover the creativity of this brand. 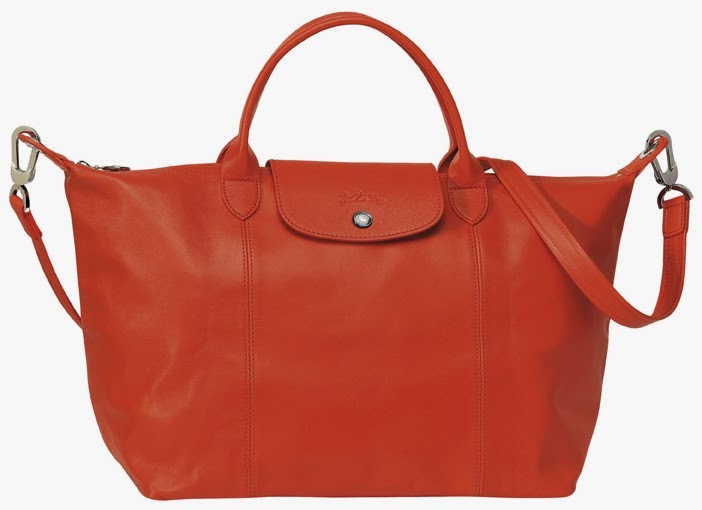 This is Le Pliage Losange, it is already available and it comes in red as well. As I said before Le Pliage by Longchamp is a very popular choice with everyone carrying one. I've seen pictures of the Duchess of Cambridge, when still she was called Kate Middleton carrying a brown version with a shoulder strap. Le Pliage Cuir is the leather version of the classic one and it is available in 8 bright colours. It is possible now to personalised your Le Pliage in nylon either on the website or in store with a choice of colours for straps, flap and handles, initials, inside lining and tabs as well choosing the size you prefer and have at the end a unique bag. This beautiful red lipstick tote is the Roseau Box, glossy and available as well as in this fabulous Carmine colour, in Ruby, in Amber,Wood and Antracite. Next to it the Too Night clutch bag, both of them have got the bamboo shaped clasp which I find stunning. The Longchamp 3D is the bag for our everyday life, spacious enough to contain all of our essentials, the leather is so soft that you can't resist stroking it all day long and beautiful bright colours like poppy and fuchsia as well as brown and black. Do you know that Longchamp has got a collection of shoes? This gorgeous Le Pliage Heritage tennis shoes matches the Le Pliage Heritage bag. The shoes are already in store while for the bag maybe it will hit the shelves in the next few weeks. Check online at www.uk.longchamp.com to know more about the AW collection and visit the stores and concessions nationwide in order to start the new season with something timeless. The shop in London at 229 - 247 Regent Street W1B 2EG is amazing and the people working there are very nice and they really know their stuff.